Could you afford to go to Kobe's final game? Tonight, the woeful Los Angeles Lakers and the hapless Utah Jazz will do battle in a meaningless regular season finale. But don’t expect to show up to the Staples Center and steal a pair of cheap seats from scalpers. That’s because future Hall of Famer Kobe Bryant will be playing in his final NBA game tonight. The Laker legend announced in November that he would be calling it quits after this season, following five championships, 18 All-Star appearances, and an MVP selection. So, how much does it cost to be a part of NBA history? SeatGeek , a sports ticket aggregator, lists the best deal for an upper-bowl ticket for tonight’s game would cost a minimum of $1,054. If you’re looking to spring for a seat closer to the floor, your best bet is a seat in the Staples Center’s section 102, which will cost you nearly $4,000. And those are just the best deals. SeatGeek’s worst deal in the building? A spot in Suite C 27, going for $14,000. Let’s hope that food and drink are all-inclusive. Once you’re inside the Staples Center, there’s no shortage of memorabilia available for Kobe’s final game. In addition to the commemorative shirt that will be draped on all the Staples Center seats on Wednesday, there’s a number of shirts celebrating Bryant’s historic career, all falling between $24.99 and $30 in the Lakers' shop. But, of course, that just won’t do it for the glitz and glam of Hollywood. For just $38,024, you can own a New Era limited release Kobe Bryant hat , according to a report from ESPN. The cap is made of snakeskin (a la Bryant’s nickname, Black Mamba) and lambskin, and has his current number (24) emblazoned on the front in 3.5 ounces of 18-karat gold. Better act fast though, as only eight of the caps are for sale (get it? His old number). For the frugal fan, New Era also produced eight purple cashmere and gold snakeskin caps that will sell for $24,008. In addition to whatever gear you decide to buy, you can expect to pay at least $30 for parking, but some reports have prices skyrocketing to close to $200. 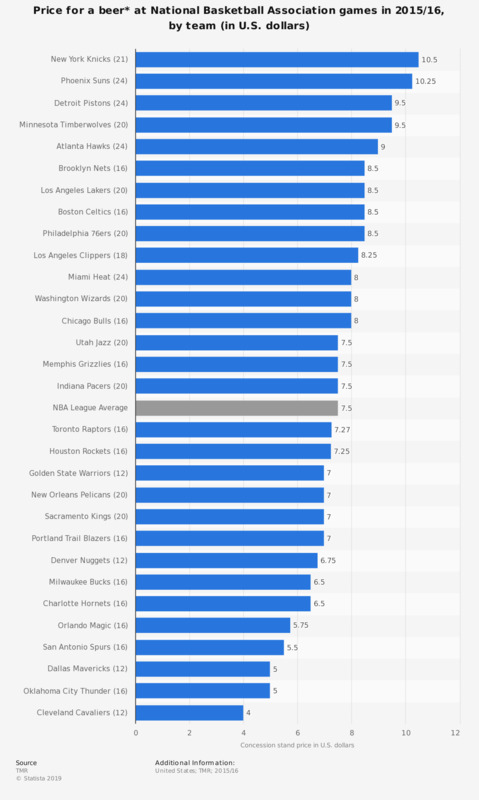 To top it all off, the Lakers offer some of the most expensive beer prices in the NBA at $8.50 per 20 oz. brew. Maybe watching from home isn’t such a bad idea.